Summer is here and you’re hopefully using it to make plenty of fun memories. Your iPhone is the perfect tool for taking photos of great trips and days out, but are you using the best app to get the most out of it? While the stock app does the job, there are plenty of better apps out there for ensuring your photos feel more like DSLR style quality than quick snaps. As a replacement to the stock app, Camera+ is an essential addition. It allows you to set exposure separately from focus, adjust how light or dark your shots come out, plus many other features. Want to zoom up to 6x? That’s possible. You can also use the Stabilizer option to steady your iPhone, proving ideal for those with shaky hands. Its Clarity mode works to intelligently adjust your photos so they look perfect every time. Snapseed is a great photo editor from Google. The app offers 26 tools and filters for healing your images, applying HDR, tweaking white balance and much more. You can layer on the effects like you would in a professional suite, tweaking and re-adjusting each step of the way. Everything can be saved non-destructively, and you can add some fun filters along the way. VSCO uses a creators community to make editing photos more interesting. You can apply film-inspired filters, as well as make professional tweaks, before sharing them with the community. RAW editing is available, along with 19 editing tools such as exposure, contrast and cropping. It all takes seconds to tweak, ensuring your photos look great every time. Enlight aims to do a little bit of everything. It allows you to use precise control over tone, coloring and details in your photos. You can reproduce the style of classic cameras and old film, add light leaks for a retro feel or turn things into a black and white piece of art. A photo mixing tool creates cool effects as you overlay two photos to produce a double exposure effect. It’s all very stylish. 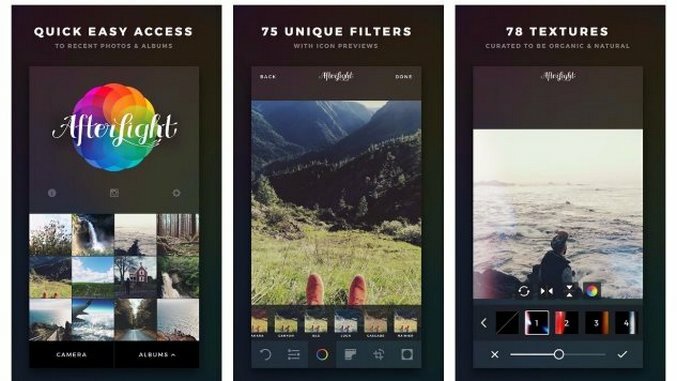 Afterlight offers 31 original filters with each of them fully adjustable so that no one photo looks alike. Alongside that are guest filters by various Instagram users, seasons filters to adapt to the time of year and fusion filters where you can mix and match textures and looks. It’s ideal for sprucing up that summer shot that didn’t quite pay off. Mextures allows you to quickly apply film grains, textures, light leaks and stylish gradients to your photos. With a non-destructive environment, you can take your photos back to the beginning any time you want. There are over 150 original textures, catering for looks such as grunge scenes, or vintage film scans. You can easily tweak exposure, contrast, tint and much more, too. AfterFocus makes it easy to create DSLR-style background blurred photos by allowing you to focus on a specific area of your image. It’s the kind of thing that lends itself perfectly to portrait shots of loved ones, or if you just want to focus on something specific in a landscape photo. You simply draw the line with your finger and the app does the rest, making your photo pop out more than before. PicsArt wants to be a one stop shop for your photography needs, and it certainly does a great job of it. Besides offering a photo editing tool with many different features, it also doubles up as a collage maker. With hundreds of free templates available, you can easily combine numerous photos together for a cool looking collage. There’s stickers and clipart ready to apply, too. ProCamera offers DSLR style controls, while remaining simple to use. You can use it to enjoy greater control over your focus and exposure points, record video at 4K resolution, as well as improve your low light photography. Essentially, it’ll keep up with you whether you’re wandering around the streets of a new city, or going exploring at speed while on vacation. Manual gives you an impressive amount of control over your photos. You have full control over the shutter, ISO, white balance, focus and exposure compensation. For the budding photographer who doesn’t want to carry a true camera around, it’s an ideal go-between, allowing them to have plenty of control over their images. There’s full RAW capture, too.